We Can Train Any Dog! Unleash Your Dog's Hidden Talents Now! Steven has always had a special place in his heart for dogs. Growing up in a farming community Steven has been working with animals most of his life, be it livestock, cats or dogs Steven seems to be able to create a bond with animals in general. Steven began his career as an Automotive Service Technician, which led him going into business for himself. Soon after purchasing his own farm Stevens love for the animals began him looking for a new direction in life. Steven began working with horses in his free time, taking his riding to the competition level of cow work on horseback. However he knew there was still something missing. The purchase of Daxia his German Shepherd helped him realize just what that was, with the majority of his customers already asking if he could train their dogs because of how smart and well behaved she was, Steven decided that was the direction he was looking for. Steven did some research and decided that the CCTA was the perfect fit for him. With ongoing support from his wife Steven closed the doors of his shop and enrolled in the professional trainer course. Even though many were impressed with the way Daxia behaved, Steven soon realized she had some dog aggression. Working through the basic to advanced obedience levels with her and becoming an even better handler himself, Daxia has become a pleasure to have around any dog. Steven has learned the difference between a dog that works for treats and a willing confident obedient dog. 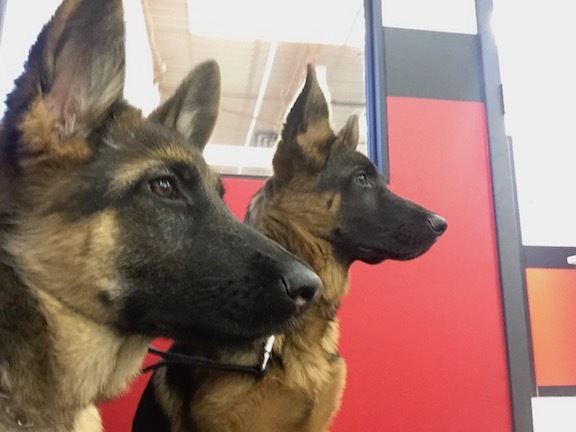 Since joining the CCTA team, Steven has purchased three more German Shepherds which have given him the opportunity to train different character dogs within the same breed. Knowing not any two dogs are the same but with the CCTA training the results are. Obedience. Call Steven Now! For a Free Training Evaluation! The purpose of the evaluation is for us to determine what the cause of your dog's behaviour is, so we can make recommendations on what needs to be done to help you meet your training goals. Because all dogs are not the same, their problems and causes for problems will vary, and so will the treatment, depending on the nature of the dog's behaviour. All dogs are evaluated prior to training to ensure you get the best results possible. This process is quite simple. First click on the Free Training Evaluation and submit the information required. The trainer will review the information to get a good idea of your case. The trainer will then contact you to make an appointment to meet with you and your dog. When the trainer has evaluated your dog's temperament, you will be provided with a signed copy of your evaluation, complete with comments and recommendations for training.